A Little Paddle Boat | Just Shooting Memories! 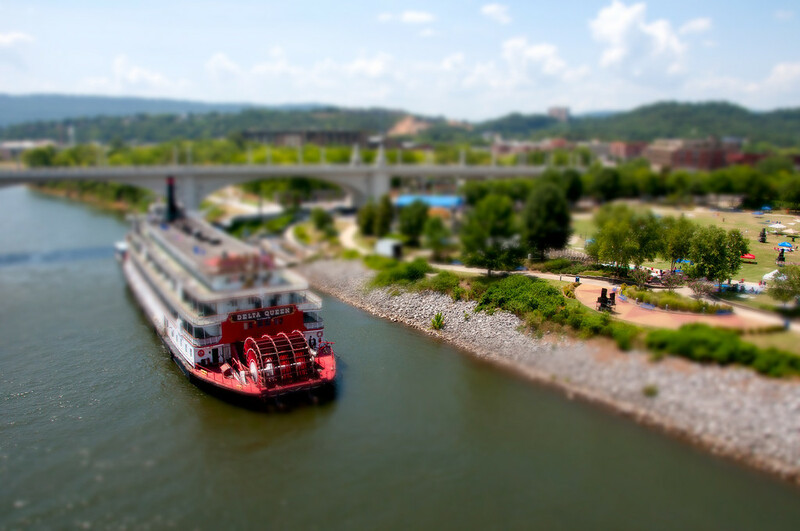 I have admired tilt shift photography for a long time. I have tried numerous tutorials, plug-ins and workarounds. Since I decided that a dedicated lens is more than I want to invest in, I have been trying the next best thing which is to make do with free. I think I finally found what I have been looking for… Toy, a GIMP plug-in. I am still testing it, but, so far, I am pleased with the results and ease of use. The Delta Queen is a floating hotel on the north shore of the Tennessee river in Chattanooga. I took this shot on July 3 while waiting for Pops on the River to start. You can see the tents and speakers set up in the grass next to the boat. I got several more shots of the Delta Queen, but held onto this one with the intention of trying out a tilt shift style processing. Looking back on it, I think I should have tried taking this again a little later with all the people in the park.